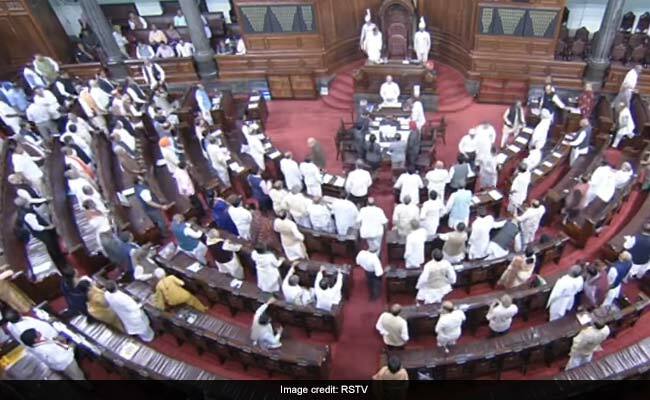 MPs later signed the members' register and then greeted Prime Minister Narendra Modi, other senior ministers and opposition leaders present in the House. Of the 58 members elected from 15 states in elections last month, 41 took oath of affirmation. 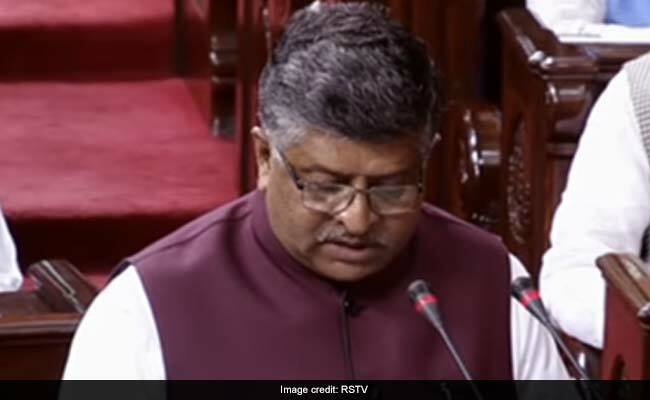 New Delhi: Union Ministers Ravi Shankar Prasad, Prakash Javadekar, Jagat Prakash Nadda and Dharmendra Pradhan were among the 41 newly-elected Rajya Sabha MPs who took oath today. Finance Minister Arun Jaitley, who was re-elected to the Upper House from Uttar Pradesh, as also members elected from Rajasthan, Telangana and Odisha did not take oath today. While almost all the members belonging to the ruling NDA took oath by swearing in the name of god, HRD Minister Prakash Javadekar, who was re-elected to the Upper House from Maharashtra, took oath affirming his alligence to the Constitution of India. TMC's Mohammad Nadimul Haque, who was re-elected from West Bengal, swore in the name of 'Allah', while Union Minister Tharwar Chand Gehlot took oath in Sanskrit. While members one after the other walked up to a specially put up microphone right below the presiding officer's chair to take oath, BJP's Saroj Pandey was allowed to take oath from her seat due to a fracture in her leg. Members after taking oath walked up to Chairman M Venkaiah Naidu who warmly welcomed them with a hand shake. Thereafter, they signed the members' register and then greeted Prime Minister Narendra Modi, other senior ministers and opposition leaders present in the House. Mr Naidu said as many as nine languages were used to take oath, reflecting India's linguistic heritage. He hoped the newly elected members and re-elected members would raise people-oriented issues and enhance the dignity and prestige of the House. Lawyer-turned-politician Abhishek Manu Singhvi of the Congress, who got elected to the Rajya Sabha from West Bengal with the support of TMC, was among those who took oath today. Among the Union Ministers who took oath included Mansukh L Mandaviya from Gujarat, Health Minister Jagat Prakash Nadda (elected from Himachal Pradesh), Oil Minister Dharmendra Pradhan (elected from Madhya Pradesh), Law and IT Minister Ravi Shankar Prasad (elected from Bihar) and HRD Minister Prakash Javadekar (elected from Maharashtra). Others who took oath included TDP's C M Ramesh and K Ravindra Kumar from Andhra Pradesh, JD(U)'s Mahendra Prasad and Bashistha Narain Singh, RJD's Ashfaque Karim and Manoj Kumar Jha (all from Bihar), BJP's Purshottam Rupala and Naranbhai Rathwa and Amee Yajnik of Congress (from Gujarat). BJP's Devender Paul Vats, elected from Haryana, took oath in Hindi. Union Minister Ravi Shankar Prasad was among the 41 MP's who took oath today. Former telecom enterpreneur Rajeev Chandrasekhar, who was elected from Karanataka on a BJP ticket, took oath in Kannada. However, three members of Congress elected from the state, including L Hanumanthaiah, did not take oath today. From Madhya Pradesh, Rajmani Patel of Congress and BJP's Ajay Pratap Singh and Kailash Soni took oath. Shiv Sena's Anil Desai, re-elected to Rajya Sabha from Maharashtra, took oath in Marathi, so did NCP's Vandana Chavan. BJP's Narayan Tatu Rane and V Muraleedharan and Congress' Keshav Chintaman Ketkar also took oath. From Uttar Pradesh, Anil Agarwal, Ashok Bajpai, Anil Kumar Jain, Kanta Kardam, GVL Narasimharao, Sakaldeep, Vijay Pal Singh Tomar and Harnath Singh Yadav (all BJP) took oath. Jaya Bachchan, who was re-elected on SP ticket, did not take oath today. BJP's Anil Baluni, elected from Uttrakhand, took oath in Hindia. TMC's Subhasish Chakraborty, Abir Ranjan Biswas and Santanu Sen took oath.